Pokémon X and Pokémon Y are two brand-new entries in the main Pokémon series coming to 3DS worldwide. The October 2013 release dispenses with the long localization times that have traditionally gone hand-in-hand with the Pokemon series. CEO of The Pokémon Company Tsunekazu Ishihara had this statement to make: "The worldwide launch of Pokémon X and Pokémon Y this October allows players to begin their adventures at the same time. Now, Pokémon fans across the globe can discover the secrets of Pokémon games and can collect, battle, and trade with each other immediately." Series director Junichi Masuda, meanwhile, said: "We brought Pokémon into an entirely new dimension and we’re incredibly excited to bring Pokémon X and Pokémon Y to fans. The stunning visuals, a completely redesigned environment, game scenario, music, and communication features will bring smiles to the faces of video game players around the world. The new Region in Pokémon X and Y is called the Kalos Region. It's based off of the real world country France. 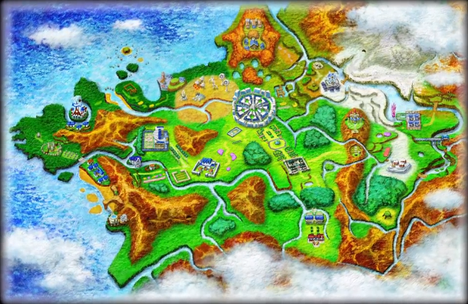 Kalos is so large that its Pokédex is split into three regions, Coastal Kalos, Central Kalos, and Mountain Kalos. There are a ton of screenshots for the new Locations and Gyms. See each page for more information. It also looks as if the new hometown in Kalos is called Vaniville Town in the Japanese version. 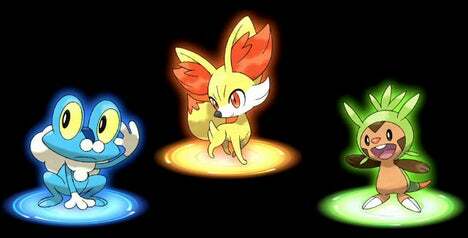 The three new starter Pokémon are grass-type chipmunk Chespin, fire-type fox Fennekin and water-type frog Froakie. Sylveon Sylveon is a new evolution of the famous Eevee. It's also one of many Pokemon to boast the new Fairy-type. Skiddo Skiddo is the pre-evolution of Gogoat. See below for info on Gogoat. Gogoat Gogoat is a new Grass-type Pokemon. It's been shown in trailers to be ride-able, and it knows the move "Horn Leech." Fletching Fletching is a new Normal/Flying-type Pokemon. It will know the move "Nitro Charge," possibly insinuating a fire-type change down the line. Pancham Pancham is a new Fighting-type Pokemon. There's not much information at this time on it. Pangoro Pangoro is the evolved form of Pancham. It adds the Dark-type to the original Fighting-type. Helioptile Helioptile is a new Normal/Electric-type Pokemon. It will know the move "Parobola Charge," which heals allies and hurts enemies. Noivern Noivern is a new Flying/Dragon-type Pokemon. It will know the move "Boomburst," which deals damage to all surrounding Pokemon. Scatterbug The Bug-type Scatterbug resides mostly in forests and wild plains. After Scatterbug has reached a high enough level, it will evolve into Spewpa. Spewpa Spewpa is the middle Pokémon of this evolutionary chain. With enough experience gained from battle, Spewpa will eventually evolve into Vivillon. Vivillon Vivillon is a new Bug/Flying-type Pokemon. It will know the move "Struggle Bug" which lowers the Special Attack of any opposing Pokemon it hits. Talonflame An evolved form of the recently announced Fletchling, Talonflame is a Fire- and Flying-type Pokémon that gains a whole new level of speed and firepower. It dives at foes, and then attacks with devastating kicks. Skrelp Disguised by its shape, Skrelp pretends to be a piece of seaweed. When prey gets too close, Skrelp bathes it in poison to keep it from struggling. Clauncher Clauncher is easily recognizable by the oversized claw on one of its arms. This useful claw can seize prey and shoot water at others as a projectile! Litleo The hot-blooded Litleo (Normal/Fire) is always ready for a good fight! Its mane blazes with heat during battle, burning hotter and hotter the stronger its opponent. Pyroar Pyroar is the evolved form of Litleo. It retains the same Normal/Fire-type. This Pokemon also has an alternate look when female. Flabébé Another newly discovered Fairy-type Pokémon, Flabébé clings to a flower early on, and then cares for it for its entire life. Because of this, Flabébé may be found holding flowers of different colors. Honedge This Pokemon is a Ghost/Steel type. It's said that a spirit resides within this old sword. Inkay Inkay is a new squid Pokemon. It is a Dark/Psychic-type, and knows the Contrary ability. Malamar Malamar is the evolved form of Inkay. Nothing changes from Inkay, other than the increased stats. Swirlix Swirlix is a new Fairy-type Pokemon exclusive to Pokemon X Version. It knows the ability Sweet Veil, which prevents its teammates from falling asleep. Spritzee Spritzee is a new Fairy-type Pokemon exclusive to Pokemon Y Version. It knows the Healer ability. Dedenne Dedenne is a new Electric/Fairy Pokemon. It will known the new Cheek Pouch ability. If a Pokémon with this Ability eats a Berry during battle, it will not only reap the usual benefits of that Berry, but will also be able to regain HP. Bunnelby Bunnelby is a new normal-type Pokemon. It will know the Pickup or Cheek Pouch ability. Furfrou Furfrou is a normal type Pokemon who can change appearance based on how you groom it. Meowstic Meowstic is a Psychic-type Pokemon that has both different forms and different moves depending on its gender.